If you are a regular reader of the blog then you know that I have struggled with headphones//earbuds for running. I loved my bose wired ones and they fit my ears perfectly but the quality given the price just wasn't there. I had them replaced twice before they broke a 3rd time and I decided to look else where for ear buds. I then ventured to the happy beats or something like that I found at best buy for $25. The reviews were good and so I bought a pretty pink pair. They were alright but they hurt my ears if I wore them too long which didn't help when training for a half marathon. Then I bought the Skull Candy wireless ones. They had the strap that went behind your neck and while they fit great, worked well and seemed to be what I was looking for. I wore them all throughout winter when I had ear warmers and jackets with hoods without incident. But then spring happened and I soon found out that the part that went behind my neck bounced constantly and it drove me insane. Even worse was when it was windy. I was disappointed and switched back to the happy beats. For my birthday last year, Greg and the girls got me the Jaybird X3 that were supposed to be fantastic based on the reviews that I read. I was never ever able to put them together to make them fit in my ears properly so I got rid of the inside the ear part and used them just as a earbud. However the silicone part that goes over the part that goes in the ear, kept falling off and it was annoying me. One time in mid march, i was running and the ear bud fell out of my ear - with the silcone part still stuck in my ear and it was in pretty deep. I remember standing on the street digging in my ear trying to get it out. Thankfully I was able to do it on my own and not make a trip to emerg haha. After that, I decided I needed to find something different. I had wanted the Apple Air Pods since they were released but I wasn't in love with the price of them. But I was tired of spending so much money on wired and wireless headphones that I hated. My synopsis wasn't even my whole running career but the last couple years haha. I saw that BestBuy had some in stock so it saved me a trip to Chinook to the Apple Store. I ordered them online so they would be waiting for me when I got to the store instead of me having to look for them myself, it is the next best thing to online shopping haha. I was still kinda sick over the price and unlike every other apple product that I have purchased, it took me a few days to even open the package. I researched on my various lulu/running/seawheeze facebook chat groups and everybody seemed to love them. I posted on my insta story that i had them and only one person said they hated them. I decided it was finally time to open them up and pray I loved them like everybody else haha. 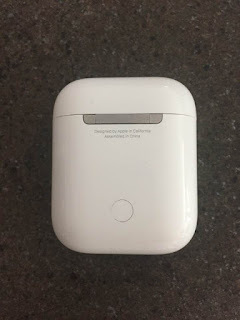 I opened the box and it was this cute little case with the airpods inside of it and a charger cord. It is the same cord that charges the iphone which is handy. You plug the charger into the bottom of the case and it charges the case. The case keeps the charge and then charges the airpods. The airpods fit quite nicely inside the charging case. They are super small and I LOVE THEM!! My only regret is that I didn't buy them sooner. I wanted to wait to give my review until after I ran the half marathon at the Calgary Marathon with them to see how they would hold up and seriously worth every single penny. I have worn them every single run since I got them right before easter, so almost 3 months and they are the best. They fit perfectly in my ears, they are comfortable for wearing them for long periods which is a good thing, they stay charged forever, they hold up and stay in when it is hot and I get sweaty and they are sweat resistant too! Greg said he would give me a week before I lost one or both and so far I have not but I did read on the Apple website that you can buy single pods for like $70 I think so you don't have to buy a brand new pair should you lose or wash one or whatever might happen. If you are on the fence about buying them, I highly recommend it. I am not kidding when I said I wish I would have bought them sooner because it is true. I love that they are legitimate wireless ear buds with not a single wire to get tangled or to bother me anywhere. And the range to my iphone and ipad is really good so that when I am streaming stuff on netflix on my ipad, i can pop them in and hear it all over my house. I also listen to them when I am doing my yard work and they are easy to use while walking the kids to and from school!! Seriously go buy them now!! !